Well, here we go again-out with the old and in with the new. As we wave goodbye to 2009, most of us set up a list of obligatory resolutions or promises of what we are (maybe?) going to accomplish in 2010. At Seriously Soupy, I too, have made my list of resolutions for the upcoming year and prospective changes for the site and the nature of what I want to do with soup. I am excited for this new year, and even more excited that you will be following me on my journey to complete these soupy tasks, which will continue to expand the site and make it the go-to resource for soup lovers everywhere. 1. Keep on Brothin'. It was rather exciting for me to actually make my own broth in 2009. Although this was with the assistance of a recipe it gave me the "wings of sorts" to actually make a broth. Now I do not think of this technique as scary or mysterious, but one that I would like make as an integral part of my soup creating process. I would also like to vary up my broth recipes, using different ingredients to create various types of veggie broths (light, medium, and dark colored ones), fish broths, chicken broths etc. A longer process, which won't happen for every soup, but I at least want to try. 2. Keep it Classy with a Serious Twist. For those readers who don't know, this blog is about my attempt to try out new soups, including classic recipes that I have never made, as well as original soup creations. For this year I would like to kick this concept up a bit and add more creative twists to classic soups. For example: let's say create I create a lentil soup. I want to make it really my own by adding spiced curry or dill, or even topping it with an egg if I so choose! Whatever it may be I would like to try out new ingredients and test out various flavor combinations that may (or may not) work together. I am hoping that this will create more unique and original soupy recipes, as well as my own variation of classic soups. 3. Techniquely Speaking. Create a new technique or two, or even three. I'm sure that most soup techniques have been tried or attempted at some point, BUT I think there has to be something out there that hasn't been done, at least techniques that mix with soups. Whether its baking soups or roasting veggies to make soups, I want learn more about various techniques cooking, (such as I did with the chocolate soup and caramelizing) in order to change the structure of soups and consistency (at least for one or two soups down the line). 4. The International. So far a lot of my soups have been very similar (veggie or bean-based), which I love, but I think these are my comfort soups and let allowing me to branch out. For 2010 I want to get out of this veggie/bean box and learn more about various methods of soup preparation from around the world. This will also involve me learning about new ingredients, new spices, new techniques, etc as I create a new style of soup that I really know nothing about. Perhaps, an "Around the Soup in 50 days" article?....check it out very soon! 5. Listen to the People. I want to hear more from you and really learn what type of soups you want me to cover on the site. Although it is about my experiences in creating these soups, the site is also about our shared love of soups that is really going to make the site entertaining for everyone. For this year I hope to set up a community forum and newsletter, but until then drop me an e-mail at seriouslysoupy@gmail.com and tell me your favorite recipe, what you would like to see, why do you love soup so much, or even just to say hi! Very excited for the year ahead and if 2009 is any indication of what I started on Seriously Soupy, this is only the tip of the soup bowl for what is to come. Pour water and coconut milk into a pot and let boil. Cut up the okra and place it in a frying pan with heavy cream. Add curry, cumin, salt and pepper to the okra. When the okra turns slightly brown place it in the coconut milk/water pot and cover on a very low flame. Start the process for the cornbread (see recipe below). When the cornbread is in the oven, add water to another pot and let boil. Add the rice to the boiling water and let cook on medium heat for 20-30 minutes. Open a can of chickpeas or prepare them from dry beans (depending on your preference). Soup should be done by now where you can place about a cup of rice and chickpeas in a bowl. Pour the soup on top and break up the cornbread into segments on the very top of the soup. Enjoy! Part Two— Cornbread, adapted from jungleswife.com. For this soup I searched for the easiest and most convenient cornbread recipe, since as I have mentioned I feel more comfortable making up my own recipes with soups and not with other food items. There are tons of recipes online, but this one from jungleswife.com was ideal, since it used minimal ingredients and even better most of which I had in the house. However, there are numerous options out there, so using what you like is always a good choice. P.S. When it was all said and done it turned out to be more of an effort than a successful soup, but I enjoyed trying something different even if it meant ending up with a bland and slimy soupy. Never having used okra before the consistency was a little off to me, but presented and exciting challenge of an ingredient and style of cooking that I have never tried and sometimes that is enough when creating and testing out new soups. I would fry the okra in some sort of bread crumb as opposed to in a cream base. I would add more vegetables such as green beans, carrots, peas, etc to give the soup more flavor. I would try to make my own coconut milk such as from this homemade coconut milk recipe from coconut recipes. To learn more about Kwanzaa check out these books. Also, please share any recipes from the holiday and pictures, especially of traditional Kwanzaa soups! Seriously Soupy: How was the carmelization process? Did you find it difficult? SS: Was it hard to find the ingredients? TV: The ingredients were easy to find as I already had most of them in my kitchen already. So that was a big plus that there was nothing exotic in this soup. SS: Why did you use three types of chocolates and which ones did you use? TV: I had to use three different kinds of chocolate since i didn't have enough bittersweet, but it ended up making the flavor really good. I used Ghiradelli bittersweet (4 oz bar), Hershey's special dark (4.25 oz bar) and 3 cubes (1 oz each) of unsweetened Bakers chocolate. I'm guessing the use of the dark chocolate probably made mine a bit sweeter than yours probably turned out. SS: What did you think of the overall process? SS: Where there any nuts in the soup? Thanks Theresa! To learn more about T, check out her photography on flickr under her monker diabolic scheme (a.k.a turtlevr's). Great mind's think alike. A rather obnoxious statement, but that perhaps rings a little bit of truth, especially as I just finished reading the article Everything From Nuts to Soup from the New York Times. The article, written by Melissa Clark talks about her preparation of chestnut soup for the holidays, and as some of you already know I posted this morning about potentially making a chestnut soup in the Holiday Redux Part Two series. Although my chestnut soup never came to fruition and another took its place I enjoyed reading about Clark's approach to her soup (adding prunes, apples, and mushrooms) and how she prepared the chestnuts (I had not gotten that far). One of these days I will get my hands on chestnuts and when I do you will sure to be the first to know! I also found this great chestnut cook book; if you find any of these recipes inspiring write to me at seriouslysoupy@gmail.com and share your experiences! P.S. Has anyone ever made a chestnut soup? I would love to hear about it. Put water in a pot and set to medium boil. Chop up the sweet potatoes, onion, parsnip, and ginger into squares and place in the slightly boiling pot of water for 30-45 minutes. In a separate and smaller pot, add 2 cups of water and add the cranberries (if using fresh). Set to a low flame and cover. The cranberries will start to pop as they open up, when this happens (about 5 minutes later) add cinnamon, nutmeg, cloves, and some sugar. About 10 minutes later the seeds will be released and the water will turn red. This indicates that the cranberries are ready. Turn off the flame and set aside this mixture. Add the heavy cream, nutmeg, cloves, cinnamon, salt, and pepper to the sweet potato mixture. Cover for another 10 minutes and check with a fork to check if the potatoes are soft. If soft, blend the mixture together with a hand blender until it turns into a puree. With a slotted spoon scoop up the cranberries and place them in the soup (try to use all of the cranberries). I also added about a cup of the remaining cranberry/water mixture and blended again. I also left my puree slightly chunky with some cranberry pieces because I like it chunky, you can puree to taste. I also topped the soup off with a few cranberries for a garnish. P.S. I used the heavy cream, partially because I still had it from the potato and leek soup recipe, but also because I wanted to create a creamier soup. It can be omitted, based on your dietary restrictions and preferences. Due to the holidays, I had to switch things up a bit with the scheduling of the posts. Instead of a full-length article I am posting my link run down today, so that I can post the Part 2 (Christmas) and Part 3 (Kwanzaa) of the Holiday Soup Redux series on Friday and Saturday. 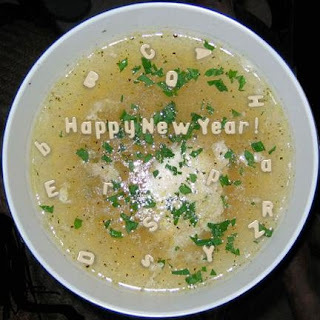 So, after that long explanation, here it goes with some interesting holiday-soup blog posts/articles. Oh, and Happy Holidays fellow soup lovers! Do-Ahead Dishes for Holiday Crowds, featured in the New York Times and written by Martha Rose Shulman the article discusses the somewhat inevitable lure of overeating during the holiday season, as well how soups are a healthy and filing alternative to combat overindulgence. The article also discusses how soups (although may involve some initial preparation) can be made ahead of time (and really any time of day) and can be frozen until they are needed. Additionally, she discusses how their measurements can be adjusted based serving needs and can be doubled up to feed large and small parties. In particular, the article gave a recipe for a bean and farro soup with cabbage and winter squash that is packed seasonal vegetables, beans and spices that I am sure will keep your hands closer to your spoon than the lure of those gooey holiday treats...or at least that is what Shulman would prefer. 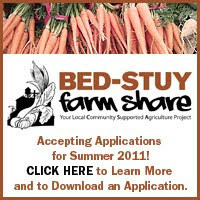 Read more about it on: http://www.nytimes.com/2009/12/21/health/nutrition/21recipehealth.html. 12 Recipes of Christmas: Mock Turtle Soup, an interesting take on the 12 days of Christmas song, Patricia and John from www.cooklocal.com created a mock turtle soup where they used beef, chicken, and pork to resemble the taste of turtle. Personally, I'm not sure what turtle tastes like, nor do I want really find out, but I really loved their take on a traditional song and twisted it with a unique blend of flavors (and meats) into an inventive and rather original soup recipe. Check out their recipe at http://www.cooklocal.com/?p=2283. Last Minute Food Christmas Gifts: Curried Soup Mix, written by Allison Lewis of ingredientsinc.net, the article gave instructions on how to make lentil curried soup mix as a holiday gift. As a bonafied last minute holiday shopper I really enjoyed reading about Lewis' DIY suggestion about to create a soup mix by essentially using ingredients that are found in every kitchen, or those that are not difficult to find or even that expensive. She included a pretty simple breakdown of what to include in a lentil soup mix such as apples, red and green lentils, and curry that could be sealed in a glass jar so that the ingredients are on display as part of the presentation. Check out this great gift idea at http://www.ingredientsinc.net/2009/12/last-minute-food-christmas-gifts-curried-soup-mix/. Add the broth and water to a pot and set to a medium heat. Chop up the leeks and the onions into thin slices and the place it into the slightly boiling pot. Peel the potatoes and cut them into squares and place them in the pot, along with the scallions and the garlic (about 20 minutes later). Cover and let cook for 30 minutes. Place a fork through the potatoes, if soft add heavy cream, salt, and pepper. Blend together with a hand blender, where you should end up with a puree. I found that my mixture was way too thick, so I ended up adding 1/2 cup more of water and a splash more of heavy cream. Remove from the heat and serve in your soupy bowls. Enjoy! P.S. As I mentioned in the intro I used all parts of the leek, including the darker part (top), but many recipes only suggest using the lighter part (bottom), which would make the color significantly more lighter and close to the look of a potato. I liked how this tasted more leek-based than potato, but again that is your preference and really you can do whatever you like when you are creating your own variation of a soup. I realize that I am a little late on the Hanukkah soup bandwagon, however I decided that I wanted to write a soup recipe article on how to turn a traditional holiday meals into a soup. So, without leaving any holidays out I am taking a "better late than never" approach with this soup for Hanukkah. As a three-part article (part two-Christmas and part three-Kwanza), this soupy features a twist on the potato latke that I converted into an apple/carrot soup topped with latke fritters. Add stock, water, and apple cider into a pot and let boil. Peel the apples and cut them into squares, making sure to remove the core. Cut up the parsnips and carrots into squares and add them and the apples to the pot and let cook for 30-45 minutes. Add nutmeg, cinnamon and sugar and let cook for another 10-15 minutes, making sure to check that the apples are soft. Add salt to taste. Turn off the flame and grind all the ingredients together with a hand blender to make an apple/carrot puree. I left it semi-chunky, but ended up adding a little more apple cider at this point to release more of the apple flavors. Set aside as the latke fritters are prepared. Since latke's aren't a soup-based component I decided that using a recipe as a base for this experiment would be helpful. I included the link above, however it was modified based on my experience. Peel the potatoes and grate them. Place them into the bowl with water as they are grated. When finished drain the potatoes very well and set aside. Peel the onion and chopping up into small squares. Place in a small bowl and blend finely with a hand mixer. You can also chop the union up until it gets very small, but I found that the hand blender gave me a better consistency. Blend the potatoes and onions together, making sure to drain as much liquid as possible. Add the egg and salt to the bowl and mix. Place oil in pan over a medium heat and let it warm up. With a teaspoon scoop the latke mix and place on the pan (since this is for smaller fritter-type latke I used a teaspoon for more traditional ones a tablespoon should be sufficient). Reduce the heat and let cook for 5-10 minutes or until both sides are brown. Pour the soup into a bowl, top with 2 latke fritters, add sour cream (optional), and enjoy! The soup turned out really well-if I do say so myself! I really enjoyed the fusion of apples and carrots with the potato latke that created a subtle taste that was slightly sweet and spiced. It also was basic enough to create any time of year, or even varied up with an apple/squash or an apple/turnip medley, along with the yummy fritters! You can also check out this handy book about the history of latkes and various methods of preparation. As part of my Monday postings (in addition to the occasional book and product reviews) I am going to test out and review established chef's soup recipes. Hoping this will vary up some techniques and teach me more about soup, I also want to review how easy, difficult, and really if I can follow instructions as I attempt to re-create a masterpiece. Rum, butter, bananas, milk, sugar, eggs, and bittersweet chocolate were the basic and easy-to-find ingredients in the recipe. Not too involved, so I thought that was a good sign that the recipe may be manageable and not too intricate. Oh boy, was I wrong! Almost 8 hours later I started the preparation of the second part. Should have been a sign that something would go wrong, especially since Torres' recipe indicates that each step should happen immediately after each other. But I was going to present the soup at a party, so I thought making the meringue there would make sense-blend the egg whites and sugar, place it on the chocolate, and bake. No problem except I guess I read it wrong and added the eggs and sugar together at once (as opposed to " adding the powered sugar 1 tablespoon at a time and whipping the whites to stiff but not dry peaks.") I misread that easy instruction and added the sugar and eggs at once, which resulted in an eggy-watery mess and not a creation that had "stiff but not dry peaks." On top of that I was at party and not getting soupy in my home kitchen, where I might have thrown it out or attempted the meringue another day. So, I tried my best to make a modified variation of JT's (Jacques Torres') recipe. I put the bananas on the bottom of a large pot, poured the liquid in (rather than individual cups) and placed in in the oven for 10-15 minutes. With no meringue I was was less-than-excited and maybe a little embarrassed to present the soupy, but with a party of 8 people eagerly awaiting this strange soup I had to present something. Personally, I thought the chocolate part was ok, the bananas didn't come out how I thought they would and ended up mushy, which may have something to do with the prolonged time I took between both parts of the prep. I also heard some comments that there was nuts in the soup (I never added nuts-maybe the caramelization? )-but that struck me as really odd. Overall, I don't think it was awful, but as someone who basically makes soups by adding various ingredients into a pot and stays true to her instincts I had challenges with the numerous dimensions of this recipe and different techniques of this soupy. I also think that it is worth trying my hand at this soupy again, but next time making sure to follow the directions with the meringue and preparing each step right after each other and not waiting 8 hours! 1. I am no Jacques Torres. 2. You need the meringue. 3. I am going to try it again. 4. I really hate working from recipes, but it was nice to learn about different techniques such as caramelizing. 5. I want to make my own variation of a chocolate soup. And the here is the actual recipe from Jacques Torres. Let me know if you have a more successful chocolate soupy experience than my own. I would love to see pics! please note: This is all of JT's writing, so where it says author notes it is JT and not Seriously Soupy. The clients at Le Cirque love chocolate desserts, so I am always trying to come up with new ones. One year, Kris and I went to Disney World. She insisted I try a frozen chocolate covered banana and, quite frankly, I questioned the concept. Well, I loved it! I didn't think Sirio would be too pleased if I served bananas on a stick at his restaurant, so here is the version I adapted for the dessert menu. I like t top the warm soup with meringue to add another layer of texture and enhance the visual appearance. Place the diced bananas in a medium-sized mixing bowl with the rum and toss to coat. Set aside to let macerate at room temperature while you prepare the caramel. Heat a heavy-bottomed frying pan over medium-high heat. If it starts to smoke, it is too hot and you need to run it under cool water, dry it, and start again. When it is warm sprinkle the sugar into the pan. Try to keep the sugar in an even layer to allow it all to caramelize at the same time. As soon as you see the sugar begin to melt, start moving the pan over the burner to keep the sugar from burning. Tilt the pan from side to side so that the melted sugar runs over the unmelted sugar. Cook until all of the sugar is a light golden brown. Chef Torres usually adds a tablespoon of butter at this stage because it makes the caramel smoother. Add the bananas and rum and spread evenly in the pan. When cooking with alcohol, there is always the chance of it catching on fire, so be very careful when adding the rum. Continue to cook until almost all of the liquid has evaporated and the bananas are soft but not mushy; they should still hold their shape. Remove from the heat and pour the caramelized bananas onto a plate. Cover with plastic wrap and let cool for about 20 minutes. Covering the hot bananas with plastic wrap keeps the caramel from drying as it cools. Pour the milk into a 2 quart heavy -bottomed saucepan and bring to a boil over medium-high heat. Add the chopped chocolate and stir until well combined and the Chocolate has melted. Bring the mixture to a boil again, stirring occasionally. Remove the pan from the heat and set aside while you prepare the soup bowls. For this recipe, the bowls Chef Torres uses hold 4 1/2 ounces. You can use any oven-safe bowls. Place one large spoonful of the caramelized bananas in the bottom of each soup bowl. The bananas will give texture to the soup, so be generous. Cover the bananas with the hot soup, filling each bowl three-quarters full. Set the soup bowls on a baking sheet and place in the refrigerator until chilled, about 2 hours. The soup will set and thicken, allowing it to support the meringue; chill it well before topping it. Place the egg whites in a medium-size mixing bowl and whip with an electric mixer on medium speed until foamy. Increase the mixer speed to medium-high and make a French meringue by adding the powered sugar 1 tablespoon at a time and whipping the whites to stiff but not dry peaks. Place the meringue in a large pastry bag fitted with a 3/4-inch star tip. 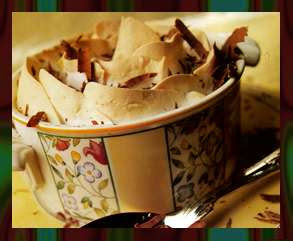 Remove the soup from the refrigerator and pipe the meringue onto the tops in a decorative pattern. Place the soup bowls in a deep roasting pan or baking dish and fill it with warm water to come one third of the way up the side of the bowls. Let stand for about 30 minutes to warm the soup. 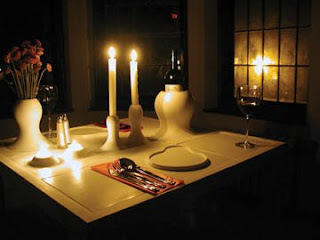 If you do this before you serve dinner, the soup should be ready to be browned by the time you have finished eating. Preheat the oven to 450°F (232°C). Remove the soup bowls from the warm water bath and place them on a baking sheet. Place in the oven just until the meringue begins to brown, 3 to 5 minutes. The soup should not get hot. Remove from the oven and serve immediately. When you cut Chocolate, start at one corner and always cut it on an angle. Don't try to cut big pieces, because it is too difficult. If you cut on an angle, it will be easier and safer. This way, you do not have to cut so much surface at one time. Chef Torres likes to top the warm soup with meringue to add another layer of texture and enhance the visual appeal. You can skip this step if you prefer. Super Bowls, featured in New York Magazine and written by Robin Raisfeld and Rob Patronite, this soup-tastic article cover the best winter soups, which as the authors note is "a bona fide culinary religion." The piece also features the 50 best soups in NYC, along with soups in rundown of soups in in New York, Boston, Philly, LA, and Chicago, and a review of the best canned soups. A must-read for soup lovers who want to check out some of the latest and greatest in the world of soups. Check it out at http://nymag.com/restaurants/features/62643/. Spotlight Recipes: 6 Easy Soups, written by Dana Angelo White, the article covers the easiest soups to prepare in the winter. White, who didn't write the recipes herself gave a summary of the best of the best in winter soups including such classics as tomato basil soup, Tuscan vegetable soup, split pea, and speedy soup, which is essentially a chicken soup with some spinach. White's organization of the recipes from the food network can be found at http://blog.healthyeats.com/blog/2009/12/14/spotlight-recipes-easy-soups/. Pour broth and water in a large soup pot. Bring to a slight boil and add the olive oil, onions, garlic, pumpkin, and ginger and let cook for 30-45 minutes. Periodically check on the soup and add the heavy cream (if desired), cinnamon and nutmeg, rosemary, and thyme and cover. After the soup cooks for one hour the pumpkin mixture will be soft and ready to be mixed together with a hand blender. With a frying pan add another 2 tablespoons to the pan and let it warm up. Add garlic,sage, salt and pepper to the pan and let cook for two minutes until the sage gets lightly browned. Place the soup in a bowl and top with the fried sage as a garnish. Pour the broth, water, onions and garlic in a large pot. Bring to steady boil on medium heat, add the lamb and cover. After 30 minutes add the squash, celery, potatoes, zucchini, leeks, and carrots and reduce heat as this new mixture cooks for another 30-40 minutes. Add sage, thyme, and rosemary and let cook for another 45 minutes to an hour until the meat is soft and tender. Add some salt and pepper to taste. Depending on your taste preferences additional thyme or rosemary may be needed or it may just be done and ready serve. Note: As a vegetarian option all you have to do is not include the lamb, and use a vegetable stock inside of a chicken for a newly named Winter Stew. Finish the night off with this refreshing and tangy Berry Wine Soup as you toast to a successful holiday party. Since this is a fresh fruit-based soup it will only keep for two-three days, so be sure to fill up those mason jars so your guests can take home any extra. *For a non-alcoholic variation, you can substitute the red wine for raspberry vinegar sauce. In a small pan, combine the pomegranate juice, blackberries, raspberries, strawberries, and blueberries on a medium heat. Add the cinnamon and clove as the mixture boils and let cook for 30 minutes. Remove the pot from the heat and let the fruit cool down. When cooled, squeeze lime and lemon into the mixture and add the wine. Place the liquid in a plastic container to be refrigerated for up to six hours. Serve cold and top with lime and lime wheels as a garnish. Note: The soup only lasts up to three days, so be sure to drink it up quickly, although I doubt that will be a problem with this wine/berry combo. I was thinking about the berry creation, and although it is delicious dessert soup I felt that the soupy party was missing something. And that something is the lack of chocolate! I found some recipes that I am excited to try (probably for Monday's post) and those that would be a perfect last impression at any soupy party. Jacques Torres' Chocolate Soup With Caramelized Bananas from fabulousfoods.com. Hazelnut Chocolate Soup from recipesource.com. Chocolate Soup Recipe from recipes.lovetoknow.com. Note: This is not just a matzoh ball soup recipe, but a great chicken stock recipe that can be used for any soup base. I modified it slightly from Grandma Fay's recipe by not throwing away the vegetables and chicken (they were also used in the soup). I also did not add enough water (I added half a pot, since the recipe did not indicate how much to put it), but I found out that the water was quickly absorbed by the vegetables, chicken, and eventually matzoh due to the long simmering process. So, for the recipe I think a whole pot of water will be sufficient. Additionally, the broth cooked for four-five hours, so allot enough time when making your broth. P.S. Timing is everything when you are making a matzoh ball soup, more so because the broth requires a lot of time to cook and retain the flavors from the vegetables and the chicken. For example: I started the broth at 1pm and it finished around 5pm. I then refrigerated the broth and started the matzo at around 7pm and finally ate at 8:30 pm! A full-day's commitment but well worth it, especially since I could really taste the difference in what a homemade broth was and I am finally no longer scared to make my own, and even excited to to this again (or my own verison of it next week). P.P.S. As I indicated in the intro I gutted a chicken, ok not one that I killed or even got from a butcher. I purchased a medium-sized whole chicken that you would buy at any store, but I guess in cooking them I usually placed it in the oven and that was that. I never had to cut it and remove the skin, and not to mention ever notice that the neck and several hairs were still intact. Maybe not the biggest of deals, but I was a vegetarian for many years and still basically eat fish or don't get down and dirty with meat prep. So, pulling apart the chicken complete with its fat, neck and feathers was simply horrifying...oh, what I won't do for this blog? How do you make your matzoh ball soup?